Pamphlet on class struggle and the unions by the anarchist-communist Guy Aldred. Taken from a collection of Aldred's pamphlets Studies in Communism,(1940). Originally published in Pamphlets for the Proletarian, No. 11, (1911). Second edition published in The Spur series,No. 4,(1919). Guy Aldred was an Anarchist-Communist, based for most of his life in Glasgow and active for many years as a pamphleteer and public speaker. More information about Aldred and the various British Anti-parliamentarians groups can be found in Anti-Parliamentary Communism - the movement for workers' councils in Britain, 1917-45 by Mark Shipway. Taken from the Class Against Class website. Trade Unionism and The Class War was published first in 1911. It met with a great deal of criticism and received one complimentary notice. This was from "Dangle" in the Clarion! It was reprinted in 1914 in the Herald of Revolt. The present edition is revised. The introductory section is expanded into a chapter. The third section of the original pamphlet - which would have been the fourth as the essay now stands-treating with the question of representation is omitted. This properly belongs to the companion essay, Representation and the State, and will be embodied in it when that pamphlet is revised. Many persons object to the reasoning of this essay because they consider its logic fatal to all idea of action. This criticism is based on a misunderstanding. I do not deny that men and women must function under capitalism and engage constantly in petty disputes. I only insist that such disputes are not 'vital. By preaching up dissatisfaction, I am removing the tendency to engage in worth-less palliative effort, and hastening the crisis. After all, action which accomplishes nothing, is not of much moment. And trade unionism has accomplished nothing so far as the well-being of the entire working-class is concerned. The plea for revolution is not pedantry. It is a simple statement of stern necessity. The second and third chapters are unaltered, except for a passing word here and there, from the original pamphlet. London, W., June 1919. G. A. A.
I. -TRADE UNIONISM AND REVOLUTION. The struggle of the Tolpuddle Martyrs for the right of combination under the Reform Ministry of 1832 marks the beginnings of British Trade Unionism. The glamour of romance which belongs to its origin has contributed to its successful development as a social institution. Eight years after the Repeal of the Combination laws, Trade Unionism was deemed an illegal conspiracy. Today, it is a bulwark of the capitalist system. Something more than tradition is necessary to explain this passage from outlawry to respectability. The explanation is an economic one. Trade Unionism has conquered social power and commanded influence in so far as it satisfied and arose from the social necessities of the capitalist epoch. Because it has answered capitalist needs, the Trade Union has qualified for its modern position as the sign manual of skilled labour. But the growth in social and political importance of the Trade Union leader has not menaced the foundations of capitalist society. He has been cited more and more as the friend of reform and the enemy of revolution. It has been urged that he is a sober and responsible member of capitalist society. Consequently, capitalist apologists have been obliged to acknowledge that he discharged useful and important functions in society. This admission has forced them to assert that the law of supply and demand does not determine, with exactness, the nominal - or even the actual price of the commodity, labour power. Hence it has been allowed that Trade Unions enable their members to increase the amount of the price received for their labour-power, without being hurtful to the interests of the commonwealth-i.e. the capitalist class-when conducted with moderation and fairness. Modern Trade Unionism enjoys this respectable reputation to a very large extent because it has sacrificed its original vitality. This was inevitable, since, in its very origin, it was reformist and not revolutionary. Trade Unionism has sacrificed no economic principle during its century's development. It has surrendered no industrial or political consistency. But it has not maintained its early earnestness or sentiment of solidarity. Had it done so, it would have been compelled to have evolved socially and politically. Instead of stagnating in reform, it would have had to progress towards revolution. The Trade Union apologist, consistently with his reformist out-look, has had to defend the restrictive tendencies of sectional organisation. He has had to deny the revolutionary solidarity of labour in order to defend the Union manufacture of blacklegs. He has rejoiced in a craft organisation that materially injures the interests of labour as a whole, without even benefiting it sectionally. He has shown no qualms about supporting a representative system of administration, which betrays the worker to capitalist interests. All this activity proceeds inevitably from the belief that Trade Unionism benefits the worker economically. It follows naturally from the notion that the worker can improve his social and economic status under capitalism. Trade Unionism, therefore, is intelligible only on the ground that reform is possible and revolution unnecessary. Industrial palliation, like political palliation, is based on the understanding that no epoch ever attains to a crisis. This is the best that can be said for the necessity of Trade Unionism. But suppose that the law of supply and demand does determine, with exactness, the nominal as well as the actual price of the commodity, labour power? Then the best that can be said for the necessity of Trade Unionism as opposed to revolutionary communist organisation and action has ceased to possess any meaning. To develop this economic argument in favour of the social revolution, and against Trade Union reform, is my purpose in writing the present brochure. II. -THE CASE FOR TRADE UNIONISM. Nominal wages are actually received in cash, irrespective of the conditions of employment. Actual wages are nominal wages, plus the conditions of employment, hours of labour, etc. What is the basis of wages? Marx has asked us to suppose that an average hour of labour be realised in a value equal to sixpence, or twelve average hours of labour realised in six shillings. If, then, in the raw material, machinery and so forth, used up in a commodity, twenty-four hours of average labour were realised, its value would amount to twelve shillings. If, moreover, the workman employed by the capitalist added twelve hours of labour to these means of production these twelve hours would be realised in an additional value of six shillings. The total value of the production would therefore, amount to thirty-six hours of realised labour-power, and be equal to eighteen shillings. But as the value of labour-power, or the wages paid to the workman, would be three shillings only, no equivalent would have been paid by the capitalist for the six hours of surplus value worked by the workman and realised in the value of the commodity. By selling this 'commodity at its value for eighteen shillings, the capitalist would, therefore, realise a value of three shillings for which he had paid no equivalent. These three shillings would constitute the surplus value or profit pocketed by him. Any increase in the wages of the workers must reduce the amount of his surplus value, since that is the only fund out of which such increase could be obtained. It is possible for the wages of the workman to rise so high as not only approximately to equal the value of his product, but actually to equal it. In a word, if the law of supply and demand works with the inexactness assumed by the Trade Unionist to be the case, palliation is not merely justifiable on the grounds of expediency; it is the direct path to emancipation. Is it true that the law of supply and demand fixes the price with so little exactness, that supply and demand become equal not at an exact point of price? May it be that several prices, or a range of prices, will satisfy the requirements of the law? That there is, or may be, a kind of table-land within which the law does not operate? Let us take the Trade Union political economists? typical example. A hundredweight of fish is sold by Dutch Auction, .i.e., the seller bidding down instead of the buyers bidding up. One buyer may be willing to give 20s. for the lot, and no other buyer willing to give more than 18s., and the man who is willing to give 20s will get the fish at 18s or a fraction over it. So that in the same market, with the same quantity of fish for sale, and with customers in number and every other respect the same, the same lot of fish might fetch two very; different prices, the law of supply and demand being equally and completely fulfilled by either of these prices. Within a limit of 2s. the law is inoperative. It is claimed, that in a case such as this, much depends on who has the initiative in bargaining. In the instance given, the possessor of the initiative gives to the seller a distinct gain of 2s., not accounted for by the law of supply and demand. Supposing the price of labour-power to fall within a similarly excepted category, the same principle as operated against the buyer in the case of the Dutch Auction will now operate against the seller in the labour market. It is the buyer who has the initiative in fixing the price. The employer, the purchaser of labour-power, makes the offer of wages. The dealer or seller, i.e., the labourer, accepts or refuses. The advantage of the initiative is with the employer therefore. This can only be modified by a close combination among the employed, whereby they may place a reserve price on their labour. Under these circumstances Organised Labour may secure a larger positive amount of the produce of its labour-power, within the limits not covered by the law of supply and demand. It may, therefore, secure the economic equivalent of culture by virtue of its organised status. Outside of this table-land the law of supply and demand remains intact. The more numerous the competitors for employment the lower will the wages be, other things being equal. This fact forces on the attention of the Trade Unionists the necessity for restrictive rules, forbidding the employment of non-unionists and limiting the number of apprentices. Such rules are indispensable to the complete efficacy of Trade Unionism. They make the Trade Unionist the apologist for an aristocracy of skilled labour. Trade Unionism's final refuge is Malthusianism. Its specious pretence is that the ignorant and untrained part of the proletariat will people up to the point that will keep their wages at that miser able rate which the low scale of their ideas and habits makes endurable to them. As long as their minds remain in such a state the Unionist claims that he does them no real injury in preventing them from competing with him for employment. He only saves himself from being brought down to their level. He does no wrong by entrenching himself behind a barrier to exclude those whose competition would bring down his wages, without more than momentarily raising theirs. Again, even were it to be shown that Trade Unionism did not increase the nominal rate of wages, it has to be admitted (says the Unionist) that it is able to do much by raising the actual rate of wages. Its least accomplishment is to successfully resist irritating, arbitrary, and oppressive conditions of employment. But the power of the organisation of labour in this direction turns upon its recognition. In times of dispute there may be room for negotiations between employers and employed upon the question of maximum or minimum demands. For the Trade Union to be effectual there can be no room for compromise on the question of recognising the Union and receiving the Union official representatives. This limits all need or apprehension of a strike to such recognition. So that the right of combination recognised, the men's demands become a matter of amicable arrangement. Such is the case for Trade Unionism. We now propose to expose its fallacies, and lay bare its hypocrisies. III - THE WORKERS' CASE AGAINST TRADE UNIONISM. (1) The operation of the economic law against the possibility of palliation, so far as the entire working-class is concerned: - Although it is true that the law of supply and demand does not fix the terms of any particular bargain, the operation of that law does not finish with the conclusion of that particular bargain. This has been clearly demonstrated by Cree in his reply to Mill. According to whether buyer or seller secures what is termed "a bargain,' - demand or supply is checked or stimulated. This applies to the Dutch Auction Fish Sale. A sale of 20s would tend to stimulate future supply and check demand. The consequent tendency would be towards a fall in price. A sale of 18s. would tend to bring out more buyers and reduce the inducement to go to sea. The consequent tendency would be towards a rise in price. This would bring out more sellers and reduce the number of buyers once more. This is true also of the wages of labour. Higher wages bring out more workers but reduce the employer's profits. So that the employer becomes less anxious to secure workers. A lower wage has the reverse effect. The worker now becomes less anxious to be employed. But the employer is more willing to employ. Once more there is repetition. Working by tendency only, the economic law approaches exactitude over a multiplicity of cases, but not in any particular case. The means of the oscillations of price is now an exact point, not a range of prices. The terms of any particular bargain are, consequently, only of the most transient importance even to those immediately concerned. But they are of little or no importance to the workers or employers as a class, since they are constantly being brought back to their true economical point. The compensating influences being inevitable and automatic, it will be seen that, in its position as a class, the working-class has nothing to gain from Trade Union Palliative activity. Its only practical hope, as well as its beautiful daydream, is, first, last, and all-the time, Socialism the Communal Individualism of which Oscar Wilde made himself the prophet in that magnificent book, The Soul of Man. (2) The impossibility of raising actual wages without regard to 'nominal wages: - Mavor has put the case in a nutshell. If a reduction of the hours of labour results in decreased production, wages will fall, other things being equal. If reduction of hours results in maintenance of production per man there will be no additional employment, other things being equal. The equality of other things turn upon the law of supply and demand which palliative combination does not effect. Consequently, Trade Unionism can neither effect wages nor yet the question of employment. (3) The impossibility of organising the whole of labour on the basis of Trade Unionism: - The Trade Unionist when excluding the blackleg and manufacturing him pretends to look forward to a complete federation of labour But if all labour stands upon the platform of palliative combination a very different thing from revolutionary solidarity - the effect will be nil in view of the operations of the law of supply and demand. A union of all labour is as good as no union at all from the palliationist viewpoint. Even a "minimum wage" of higher rate than at present established means only the decreased purchasing power of money. Between labour-power as a commodity and other commodities there exists a definite ratio of exchange. So that a 'minimum wage" is meaningless. But a union of all labour on the basis of Trade Unionism is impossible. With all trades organised on a restricted basis it would be impossible for any trade to rid itself of its surplus by causing them to be absorbed into any other trade. But for Trade Unionism to succeed - with the increasing use of machinery and the consequent reduction of skilled to unskilled labour-it must also organise unskilled labour. Such organisation to succeed must be even more restrictive than in the case of skilled labour. Unskilled labour cannot, therefore, absorb the surplus from all the skilled trades Not only so, but to this surplus it would add an enormous surplus of its own. So that restrictive Unionism can only result in first deluding the working-class, then betraying it, and finally reducing the greater portion of it to blacklegs in the present and future. (4) The menace of Trade Union Representation; A question of Labour Leading: - Trade Unionism embodies the menace of the representative system in its constitution no less certainly than the legislative machine. 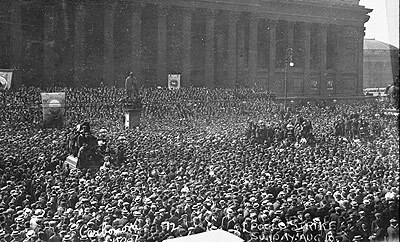 Its elected leaders conclude strikes and disputes by consenting to terms of compromise offered by Capitalistic Ministers for Labour, and Presidents of the Board of Trade. To pretend that such terms of agreement are antagonistic to capitalist interests is to be disturbed by a bogey. On the other hand, for what does the strike-leader generally strive? To get his authority recognised. This is the first step to position.and power. It is pretended that the greater the support given to the labour-leader the greater the concession he can wring from the capitalist class It is forgotten that the greater the confidence reposed in him, the more effectually he can betray that confidence. Consequently, your "official" strike-leader is always for "enthusiasm and earnest-ness" of the "slow and sure" variety. His plea is for caution, which means that he is to be allowed to do the bargaining but not to be submitted to criticism. Criticism be regards as a menace to his authority. It certainly reduces his selling-out value. (5) The initiative Absurdity: - The Trade Unionist argument that the unorganised worker suffers from not having the initiative is nonsense. Rather - if it really counted, which it does not - one's sympathy should be with the employer who uses it against the unorganised worker. In the case of the organised Trade Unionist, it should be with the worker who is menaced by having it used on his behalf by the labour leader who generally succeeds in misrepresenting him. Everyone knows that employers often throw the onus of initiative on the worker. In a bargain both buyer and seller are anxious only to avoid it. "What do you want?" says the buyer. "That is not the question, what will you give?" replies the seller. Both parties are desirous of securing a bargain, and consequently avoid the initiative. It has no advantages although it operates very little one way or the other in the labour market. So that Trade Unionism has nothing to offer the worker in this respect. On these counts, therefore, and for these reasons, Trade Unionism must go. The only hope of the workers on the industrial, as on the political field, is Revolutionary Socialism. IV. - THE QUESTION OF REPRESENTATION. Much that has been urged in the present brochure has tended to negate the idea of majority rule, as also the representation principle. Like most rebels - and, for that matter, most students of history - I have no faith in the majority, less unbelief in the minority, and most reliance in the individual. Thomas Paine regarded Government as being, like dress, a badge of lost innocence. He also looked upon the abolition of formal government as the beginning of true association. This seems to me to be incontrovertible. Consequently, if my opinion be correct, representation, as an expression of formal government, can have no weight, and must necessarily play a small part in the revolutionary birth-struggle of the proletarian commonweal. To bring this theory down to the realm of the practical, I want the reader to consider the following case which has often been put to me in the course of debates and discussions in which I have played the part of principal. It has been said that if a certain individual was working in a shop where sixty men were employed, and fifty wished to come out on strike whilst ten wished to remain in, the author of this hypothetical case was in favour of coercing the ten and making them come out, whilst the fifty fought the "boss." Such coercion, it is urged, alone will rid the proletariat of their subjection to the capitalist and Capitalism. From this opinion I venture to differ. Indeed, I repeat in print what I have often urged on the platform in reply to the hypothetical case already enunciated that the majority have no more right to coerce a minority than the minority have to coerce a majority. The fifty have no more right to coerce the ten, than the ten have to coerce the fifty, since in relation to society, the hypothetical fifty strikers are but a small minority, and if it be true that many are right where few are wrong, then the presence of seventy strike-breakers in the neighbourhood of the strike plus seventy soldiers, would entitle the "majority" of 150 men, as opposed to the minority of fifty, to "coerce them" out of the neighbourhood. Herein lies the capitalist apology for Mitchelstown, Featherstone, Homestead, Belfast, and every other scene of the patriotic murder of the working-class by the hired assassins of profit mongers. For it must be remembered, that we are not treating of the ethics of coercion in relation to oppressed minorities, but of the economics of apparent majorities' rights to coerce a minority. If we were to consent to deal with probabilities rather than with fact, it would be urged that the one hundred and fifty men do not represent society, nor the whole working-class, for it is probable that the latter would stand by the fifty. Yet every worker, as also every employer, knows that the news of the strike could be flashed throughout the length and breadth of the land without the official scoundrelism which imported blacklegs being denounced to the extent of all the workers striking in sympathy and thus threatening to coerce the blacklegs who were in a minority. With all their feelings of sympathy and faithful devotion to the cause of united endeavour it would be impossible for the whole working-class organisations to exhibit industrial solidarity. If all the workers were willing to strike, they need only stay in work and take over the means and instruments of production for their own use. Revolution would replace a mere industrial struggle. The workers would not be concerned with craft or industrial divisional organisation, nor with the local coercion of blacklegs, nor with the propaganda-strike even, but with the emancipation of their class only. The struggle would be constructive, not negative. There would be no necessity for ''physical force coercion of blacklegs, since the economic existence of gentlemen of this fraternity would be impossible under such circumstances. If all the workers were educated up to that stage of economic solidarity, that they were willing to strike in sympathy and massacre blacklegs according to Union-laid regulations, the working-class revolution would be international and spontaneous. There would be no strike for higher nominal, or for higher actual, wages; only the coming together of the workers internationally for the political and industrial overthrow of the bourgeoisie, and the taking of whatever united industrial and political activity the Class War demanded by way of its culminating expression. If the workers declined to strike in sympathy, it would be because they did not sympathises industrially with the revolting fifty. Yet, as consumers and fellow wage slaves, by the logic of economic production and distribution, they would be affected alike by the existence of the strike and its termination. The question as to whether they were right in passively siding with the employees does not enter into the problem as stated by the psuedo-proletarian defender of representation. The only question is the right of the majority. By refusal, the majority have shown that they are opposed to this gentleman and his forty-nine imaginary colleagues. His position is altered slightly, and the manifesto of the resolute fifty now is addressed to the whole of the rest of the working-class, which is engaged not in striking in sympathy, but in passively siding with local minority of blacklegs and the Capitalist class. The manifesto, therefore, should run: "Being in a shop where sixty men are at work, and fifty of us want to strike, and ten do not, I am in favour of coercing the ten and making them come out, while we fifty fight the 'boss.' As the rest of the working-class and the whole of the Capitalist class side with the 'boss' and the ten non-strikers, I am in favour of coercing the majority of my own class and the whole of the Capitalist class also." What would be society's answer? Why, that of the Trade Union-apologist-or-strike-believer-in-majority righteousness! Thus, a worker who was not in favour of the striker would say : -"If I am in a society where a vast majority of the proletariat can have their present ill-being intensified, and poverty added to their poverty, by fifty men going on strike, I am in favour of coercing the fifty and making them go back to work, whilst we, the majority of the workers, meet the 'boss' through our representatives on arbitration and conciliation boards, and through peaceful agencies, secure higher wages and better conditions." Maybe the revolting strike defender would turn aside with his sturdy band of followers, numbering forty-nine all told and sighing somewhat critically, relieve his feelings by giving utterance to the following piece of philosophy "The majority have no more right to coerce a minority than the minority have to coerce a majority. The fifty have no more right to coerce the ten than the ten have to coerce the fifty. Society has no more right to coerce the fifty strikers than the fifty strikers haveto coerce society But the minority has as much right to coerce majority as the majority has to coerce the minority.Ten strikers have as much right to coerce fifty non-strikers as fifty have to to coerce ten non-strikers. And society has as much right, and no more, to coerce fifty strikers as fifty strikers have to coerce society. Where might reigns rights do not exist. Where the political reflex of industrial complexity is centralisation of control and administration, individual autonomy is impossible. The only question is: Seeing that the emancipation of the working-class means the emancipation of the world, and that we base our argument on logic and reason; that by quiet and resolute activity the workers can he brought together in one revolutionary 'Impossiblist' movement to tie up the workshops of the world, amid the anathemas and violence of impotent Capitalism struggling in its death-throes; that violence against our own class can never atone for the violence of the capitalist against us, but only make for an orgie of bloodshed which will delay the sure and certain overthrow of parasitism; seeing, in fact, that Socialism is inevitable and that the very oppression of the working-class constitutes its final economic and political strength, is extraneous violence, i.e., an interference with the liberty of the strike-breaker by virtue of physical force above and beyond the law of economic effect in production, distribution, and consumption, advisable in the interests of the workers to-day, and the securement of the commonweal for which they are striving?" This, I repeat, is the question which our physical force constitutional palliationist, supposing he understood the situation, would ask himself. My reply - since I own no arsenals, have no monopoly of gatling or Maxim guns, and am not a Nonconformist Cabinet Minister - would he "no," especially since, in accordance with the law of social evolution, I believe in conserving all the principles of past progress in the direction of liberty. And freedom, so far as economic tendencies permit, I hold to be such a principle. Indeed, the fact that I have to so qualify it, means that the right of freedom is admitted, with rare, if any, exceptions, so long as the economic status quo is not disturbed. Though the expression of the Class struggle will be political, its basis will be economic, so that it can no longer be willed into a physical force one. It does not require that the reader should agree with me on this point for him to realise that no prerogative to murder, boycott, or coerce is specially invested in the majority, because the deity of abstract rights has decided that the majority is the majority. If coercion be right, its successfulness must decide its employment. Successful or otherwise, it is no more right for the minority than the majority to coerce, and neither more nor less obligatory upon it not to do so. This is my position - as a Socialist - of equal rights for majority and minority, which, being recognised, would not lead to the hopeless confusion that majority rule does. It is a confusion of bourgeois begetting, leading to the experiences of Motherwell, Hull, Grimsby, Featherstone, Penrhyn, Mitchelstown, and Belfast. The negation of the alleged right of majority violence is based upon the' economics of the Class War. Our Trade Unionist friend, with his loose revolutionary violence and threatening, as opposed to a sound revolutionary activity, finding himself either consciously or unconsciously on the side of bourgeois society, will insist that there must be representation and delegation of authority. To this I reply with the statement of Marxian philosophy, that every industrial epoch has its own system of representation. The fact that minority and majority rule find their harmonious expression in the political bureaucratic autocracy of capitalism signifies that its negation in the terms of Socialism shall embody a counter affirmative which embody the principle of true organisation and freedom of the individual idiosyncrasy. What the details of that organisation will be shall be made the subject of discussion in another essay. That it will not be "a Socialist majority" can be seen from the fact that democracy usually signifies the surrender of majority incompetence and mis-education to the interests of minority expertism and bourgeois concentration of its power over the lives and destinies of the exploited proletarians, no less through the medium of the worker's Trade and Industrial Union, than through that of the Capitalist State. Marx truly conceived of the bourgeois State as being but an executive committee for administering the affairs of the whole bourgeois class, which has stripped of its halo every profession previously venerated and regarded as honourable, and thus turned doctor, lawyer, priest, poet, philosopher, and labour leader into its paid wage workers. The Trade Union becomes daily more and more an essential department or expression of the bourgeois State. Out of the class or property social system there cannot emerge a "representation" which signifies an honest attempt to secure just exposition of principles and expressions of antagonistic interests. Where there is no social or economic equality, there can be no democracy and no representation. The barren wilderness of money-juggling "freedom" cannot secure real personal liberty of being to any citizen. True organisation like true liberty belongs to the future - and the Socialist Commonwealth, or, as I have termed it elsewhere, the Anarchist Republic.